Manufactured by Irving Air Chute of Great Britain Ltd. Size Large. Dated 17th & 25th September 1940. Dual Purpose type with provision for clip-on seat or chest type parachute packs. 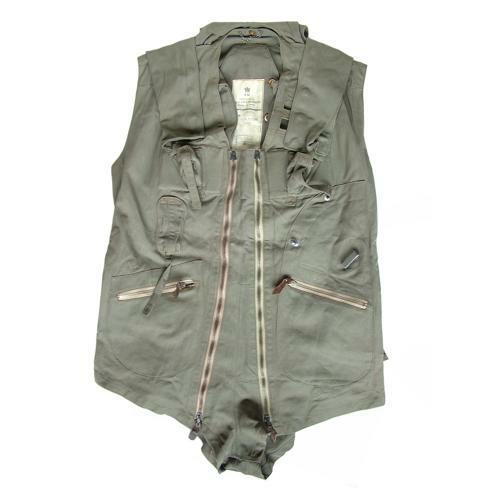 Manufactured from heavy olive drab cotton with twin front zip opening and zipped pockets. The suit is in excellent, probably unissued condition. The material is very clean and without wear or damage. Complete with the detachable fabric stole that would contain the inflatable stole (bladder). Both stole and the actual harness are not present (the latter of which never ever turn up). Excellent large Air Ministry and A.I.D marked label. Chain hanger. A superb piece of kit and useful for filling a mannequinn as it removes the need for a separate parachute harness and mae-west. Stock code S17774.